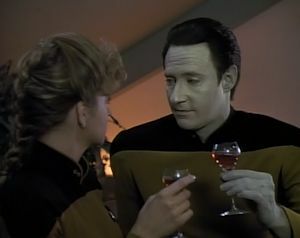 Data attempts a romantic relationship while the ship encounters bizarre phenomena related to a dark matter nebula. A dark matter nebula, eh? Too bad nobody knows what the heck dark matter is, or even if it forms nebulae. Whenever you come across dark matter in sci-fi, it's a red flag that the writer is just making stuff up. I wish they'd have come up with something a little less obviously bullcrap, called it some form of exotic matter or anything but dark matter. Data says the kiss could be described as "very passionate," but it looked more like a long peck, at best. I like the series of short scenes where Data goes from crewmember to crewmember for advice on whether or not to pursue a relationship with Lieutenant D'Sora. It's a nice, amusing exploration of their characters. My favorite is probably Picard: "I will be delighted to offer any advice I can on understanding women. When I have some, I'll let you know." Again with the "hey, let's just hang out until we can figure out why there's all this crazy stuff happening." A hull breach forms in the observation lounge, which luckily had no one in it, and nobody stops to consider the fact that they are all in a ridiculous amount of danger? Granted, in this case, it proved to be the right decision, as a hasty retreat would have probably been catastrophic. The image of the engineer halfway through the floor, blood trickling out of her nose, is sufficiently creepy. Picard's decision to pilot the shuttlecraft is a nice touch, a wholly consistent reminder of how he flew the Enterprise to safety in "Booby Trap." At least Data still has his cat. That ending is incredibly enigmatic, but perfectly logical given the circumstances. I can see what this episode is trying to do with Data, and for the most part, it is an interesting dynamic. However, the story never quite settles on an appropriate tone and the puzzle show B-story--which has absolutely no thematic relationship to the A-story as far as I can tell--is pretty weak and underdeveloped. There are some fun gags and good scenes, but there is nothing especially poignant or memorable. This is one of those episodes that needed a lot more work at the script stage. When Guinan offers Data the green drink and asks his opinion of it, it reminds me of a similar scene in Star Trek: Generations, but the differences between those scenes are more telling than the similarities for how far Data develops, as a character, between this episode and that movie.